As President Benigno “Noynoy” C. Aquino III delivers his State of the Nation Address, progressive organizations will hold a protest action along Commonwealth Avenue in Quezon City today. They will criticize Aquino’s policies that did not serve the interests of the Filipino people. Follow Bulatlat’s coverage via our Twitter and Facebook account. Good grief! Noynoy and Dinky’s conditional cash transfer (CCT) program which has tens of billions as doleout has been going on for two years, with a lot of anomalies and irregularities found by the official auditing body, the Commission on Audit (CoA), yet there went Malacañang and Noynoy, through his spokesman, Edwin Lacierda, still blaming Gloria Arroyo for these anomalies. A report stated that Malacañang had admitted that irregularities and other anomalies that hounded the administration’s main poverty alleviation program called the Pantawid Pamilyang Pilipino Program (4Ps) can only be blamed on former President Gloria Arroyo. Lacierda even lied with a straight face, claiming that the irregularities in the CoA report covered the years of Gloria, even when it was clear that the CoA report covered the year 2011, which falls under Noynoy’s term. The US government has made repeated covert attempts to block arms and oil shipments to Syria, the Wall Street Journal reports. Officials said Washington also provided rebel forces with key military intelligence against President Bashar al-Assad. The WSJ cites unnamed government officials in its report, which claims that the US has tried to coerce Iraq into blocking flights crossing through its airspace that are suspected of carrying weapons and supplies to the Assad government. A second case of deadly police-involved shooting is reported in Anaheim over the weekend. It comes just a day after police shot a 24-year-old man, sparking chaotic protests. Police shot dead a handcuffed man in the Guinida neighborhood of the city, reports OC Weekly, citing eyewitness accounts. A series of blasts and shootings has brought the single-day death toll for brutal attacks across Iraq to 89 victims, including 13 Iraqi soldiers. With 223 more wounded, the attacks signal the worst outbreak of violence in the country this year. ­On early Monday morning, unidentified gunmen attacked an Iraqi military base in the town of Udaim. The terrorists arrived in three vehicles and opened fire on soldiers, reportedly killing 13 of them, Reuters reports. The contents of Noynoy’s State of the Nation Address (Sona) were previewed by the Palace with reporters before the weekend and it seems the final cut would be a major revision since the usual formula of claiming achievements solely by blaming everything on the past administration and for which Noynoy is being criticized heavily as he always says it is Gloria’s fault. Constantly bashing the heads of his enemies won’t work this time and insisting on it would only strengthen perceptions that nothing indeed was achieved in the two years that Noynoy has been in in power. By now, given the frenzied issuances of the Palace and various government agencies and officials of their “accomplishments” and “advocacies”, we should already have an idea of what P-Noy’s third State of the Nation Address (Sona) will dwell on. It will definitely highlight once again the regime’s anti-corruption efforts with the usual suspects as main props. MANILA – With their daily income hardly enough to feed the family, they could not afford to have anyone get sick, said Arlene Acabo, 42, a resident of Tatalon, Quezon City, said. “Our health is among our top priorities, especially when it comes to my children. They are sickly. We live near a river so our home usually gets flooded. We are exposed to so many possible sicknesses,” Acabo said. Acabo joined Gabriela, the country’s largest women’s group, in calling on President Benigno “Noynoy” C. Aquino III to look into the welfare of Filipino women in a recent protest action at the foot of Mendiola Bridge. During the rally, one protester dramatized their plight when she lied down on a hospital stretcher with an intravenous drip. 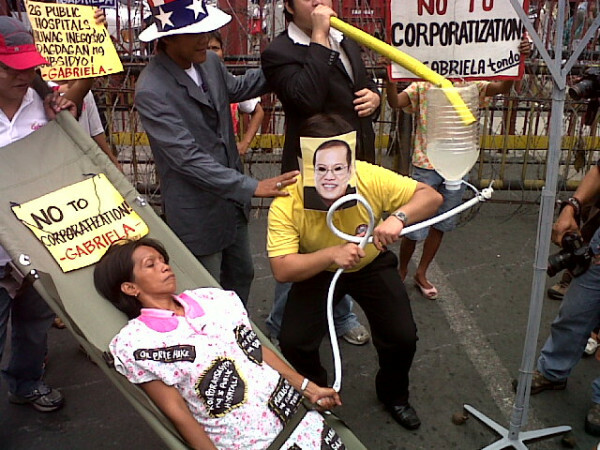 Gabriela, in its statement, described it as a portrayal of how Aquino’s policies are tormenting the Filipino people. Acobo said public hospitals are of great help to their families. Sometime in October last year, a dog bit her. She was brought to a nearby private hospital but was rejected when they said they could not afford to pay the down payment right away. Acobo could no longer remember how much it was but it was something that she and her husband, who works as a sewer in a garments factory and takes home only $70 a month, could not cough up in an hour or two. “The check up was already worth $6 and it does not yet include the shots,” she said. They moved to San Lazaro Hospital, a public hospital, and paid only $0.70 for the check up. The staff immediately cleaned her wound. Acobo bought the vaccines outside the hospital. The nationalist economic group Freedom from Debt Coalition (FDC) dared Aquino to define in the Sona its economic governance approach of “inclusive growth” in that nobody will be left behind as the economy grows. “Without the anti-corruption drive, the economic governance approach of Aquino, or as some quarters call it “Aquinomics,” is no different from the 10-year reign of “Arroyonomics,” according to FDC. Aquino will deliver the address, which had to be revised nine times, in front of a Joint Session of Congress at the Batasan Pambansa and is expected to start around 3 p.m. The Senate and the House of Representatives would be convening separately in the morning before heading for the joint session which would formally pave the way for the event which costs the government P2.7 million just for the food of the guests. Arroyo added that he did not expect Aquino to deliver an astounding third Sona, saying the address would likely follow what he described as “traditional ritual” and would contain his administration’s accomplishments and plans for the coming years. A veteran newspaper columnist and former head of the Philippine Tourism Authority (PTA) is in a critical condition after he was shot in the face during a robbery yesterday, police said. Nixon Kua, 49, was “hit on the face and different parts of his body” by one of four gunmen who attacked him and his younger brother, Allyxon, 46, in the latter’s residence in Calamba City, Laguna, police said in a statement. His brother was also shot several times in the body, but was later declared out of danger at a hospital. The motive of the attack was unlikely connected to Kua’s work as a journalist for tabloid Pilipino Star Ngayon, police said. Malacañang is expecting political allies like Sen. Antonio Trillanes to be the last persons to defend fugitive retired Army Gen. Jovito Palparan. Trillanes was a fugitive soldier himself during the Arroyo administration. A top Malacañang official dismissed fears over reports that the administration was pushing the privatization of government hospitals. In a press briefing, presidential spokesman Edwin Lacierda also sought to allay concerns by some local officials that the poor would lose access to free hospital services. The Quezon City Veterinary Office (VO) has closed down seven dressed chicken suppliers’ facilities at a public market for violating provisions of the sanitation and meat inspection codes. The VO’s sanitation enforcement team, assisted by field personnel of the local Market Development and Administration Department (MDAD), confiscated several chicken heads during the operation, city veterinarian Ana Maria Cabel said. Earlier, Cabel had called for a strict monitoring of different dressed chicken facilities in the city to ensure they conform to sanitation standards prescribed by the local health department. During the operation at the Kamuning Market, Cabel noted that most of the facilities were operating without proper drainage system and tiled flooring. Whatever human rights records President Aquino might report in his third State of the Nation Address (Sona) today, his “daang matuwid” will always be “bloody and anti-people,” militants said in a prepared statement yesterday. The protesters, who had been conducting a people’s Lakbayan or March since yesterday, came from various provinces of Southern Tagalog and gathered at Mendiola to mount a timeline that enumerates human rights abuses and anti-people policies under the Aquino administration.